The body of Sgt. 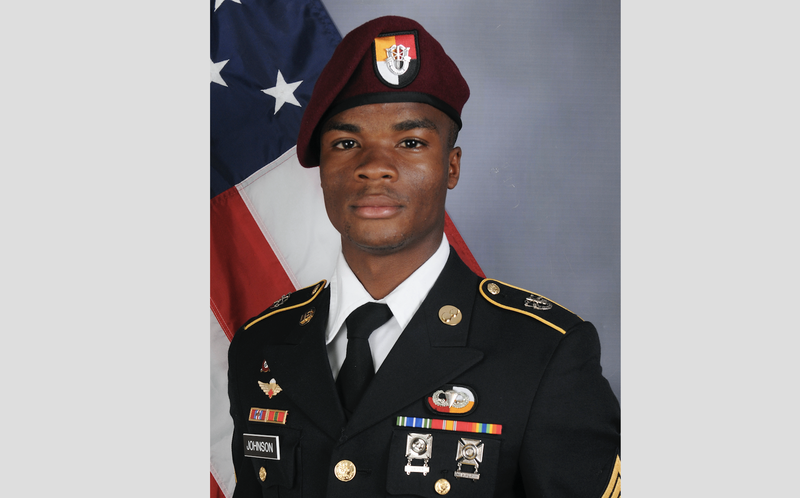 La David Johnson, the U.S. soldier killed in Niger in the deadliest combat mission during President Donald Trump’s tenure, was found with his arms bound and a vicious head wound, which many view as evidence that he was executed. The Washington Post reports that 23-year-old Adamou Boubacar, a farmer and trader, saw Johnson’s body after an ISIS-claimed attack that left Johnson and three other American soldiers dead. Five Nigerien soldiers also died in the attack. Boubacar said that he viewed the body Oct. 6, two days after the attack outside the remote Niger village of Tongo Tongo. The Post reports that Boubacar found Johnson’s remains about a mile away from the ambush site, lying facedown. The back of his head had been smashed by something. “His two arms were tied behind his back,” he said. The village chief of Tongo Tongo, Mounkaila Alassane, confirmed the account in a separate interview with the Post. As reported earlier by The Root, Johnson’s body was returned to his family 17 days after he was first reported missing in Niger. The military wouldn’t allow his widow, Myeisha Johnson, to see his body, offering the severity of her husband’s body’s condition as the reason. “I want to know why it took them 48 hours to find my husband. Why couldn’t I see my husband? Every time I asked to see my husband, they wouldn’t let me,” Myeshia Johnson told ABC’s George Stephanopoulos on Good Morning America. The villagers’ accounts come as the Niger operation is under intense scrutiny in the United States, with lawmakers expressing concern that they have received insufficient or conflicting information about what happened. As reported by The Root, the Pentagon is currently investigating the circumstances of the attack. In a recent press conference, Chairman of the Joint Chiefs of Staff Joseph F. Dunford Jr. said that the Pentagon is investigating whether the U.S. Special Forces team altered their mission, whether they had the means to call for help and how Johnson wound up being separated from the group. Johnson’s widow was attacked on social media after receiving a controversial condolence call from Trump about the death of her husband, in which she noted that the president was callous, saying that her husband “knew what he signed up for.” The president subsequently tweeted and basically called her a liar. Rep. Frederica Wilson (D-Fla.), a friend of the family, was also attacked by Trump and social media cretins.